Each year 300,000 young people with disabilities age into what should be the workforce. Sadly, despite the fact that most want to work, the majority do not get jobs. This costs them the dignity and income of work, while it robs employers and our nation of the benefits of their many talents. However, new data from the Disability Compendium shows that in states where leaders, employers and people with disabilities do the right things, people with disabilities are twice as likely to have jobs than in other states. South Dakota ranks first in the nation for employment of people with disabilities. Rounding out the top five states in terms of best employment outcomes are North Dakota, Iowa, Nebraska and Wyoming. Indeed, fully half (one-in-two) the working-age people with disabilities in South Dakota have a job. Individuals with disabilities in South Dakota are TWICE as likely to be working as those in the worst performing state of West Virginia where only a quarter (one-in-four) have jobs. In the last years, with strong leadership from Gov. Terry Branstad and then Sen. Tom Harkin, Iowa made the most improvements of any state on jobs for people with disabilities. It jumped from number seven to the number three in terms of best places for people with disabilities to get jobs. In 2013, 44.8 percent of Iowa's 169,300 working-age people with disabilities were employed. One year later, in 2014, 46.5 percent are employed. Recently, groups such as the Iowa Vocational Rehabilitation Services (IDVR) and the Iowa Developmental Disabilities Council, in partnership with other organizations, have come together to establish the Iowa Coalition for Integrated Employment. Iowa uses Project SEARCH and other methods to successfully transition youth with disabilities into good jobs in their communities. The coalition also has strong partnerships with key employers including Kwik Trip, Winnebago, Manpower, Unity Point and other companies. Iowa also helps people with disabilities start their own companies, such as Em's Coffee Company and Johnston Creek Farms. Many people make the mistake of thinking that unemployment numbers are the best indicators of the strength of an economy. That is a mistake as those numbers only reflect people who are actively looking for work. As many people with disabilities are told that they will never be hired, or have given up looking for work, most people with disabilities who want a job are not reflected in unemployment numbers. Indeed, increasing unemployment numbers could be a sign of GOOD economic health if it means that more people with disabilities have decided to indeed enter the job market. The best indicator of success is the labor force participation rate (LFPR). The LFPR represents the proportion of the population that is in the labor/work force. For example, if there are 100 people in the population ages 16 to 64, and 65 of them are working, then the labor force participation rate is 65%. It is vital however to break up that population overall and see how people with disabilities are doing compared to those without disabilities. The gap between these groups - people with and without disabilities - is the most important metric of success or failure of a states ability to enable people with disabilities to gain jobs and economic independence. The ten states with the worst labor force participation rates for people with disabilities are West Virginia, Alabama, Kentucky, Mississippi, South Carolina, Arkansas, Michigan, Georgia, Tennessee and Florida. However, in some of those states, their economies are not doing well overall and so employment overall is depressed. Thus, the better picture is indeed the gap in labor force participation rates between people with and without disabilities. 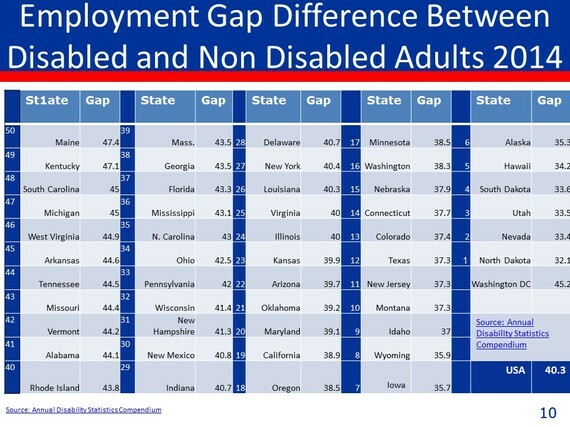 The ten worst states in terms of the biggest gaps between the labor force participation rate (LFPR) of people with disabilities and without disabilities are Maine, Kentucky, South Carolina, Michigan, West Virginia, Arkansas, Tennessee, Missouri, Vermont and Alabama in that order. That ordering is extremely interesting as it suggests that best practices, not race, dominate outcomes. Indeed, many previously thought that racial issues and prejudice predominately determine employment outcomes for people with disabilities. While racial prejudice and a lack of access to disability services, especially in terms of early intervention and special education, play important factors, some of the best states in terms of gaps in labor force participation rates (i.e. the Dakotas, Iowa, Nebraska and Wyoming) AND worst states (i.e. Maine and Vermont), are majority white states. This shows that other key issues beyond race impact performance metrics. In most states, the gap in labor force participation rate between men and women and people of different racial backgrounds is shrinking. However, the opposite is true for the gap in the labor force participation between people with and without disabilities. The gap remains massive and, despite good intentions, is growing in most states. 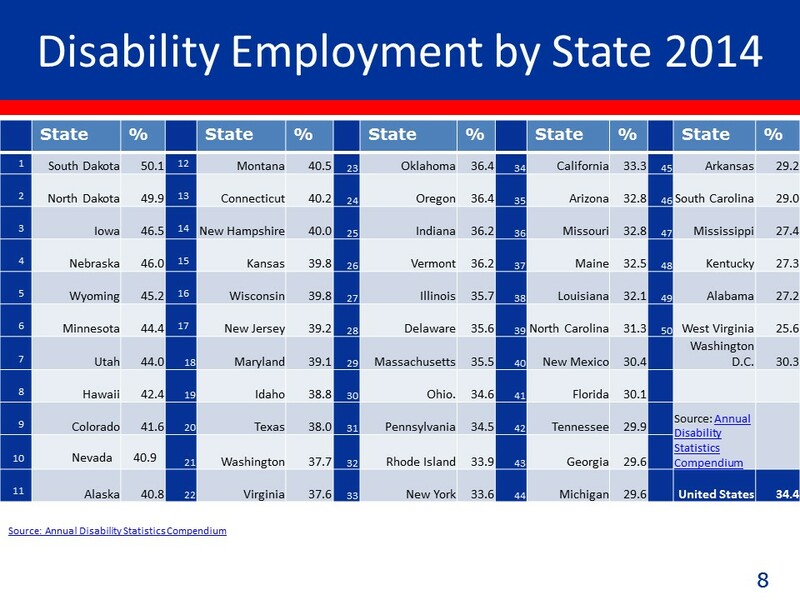 The data also shows that employment rates also vary by type of disability as well. Among people with disabilities, employment rates are highest for people with hearing disabilities (50.7 percent) and vision disabilities (40.2 percent). In the last decade, there have been major improvements in assistive technologies that enable people who are deaf to "hear" and people who are blind to use screen readers to access computers. Outcomes are the lowest for people with self-care (15.4 percent) and independent living (15.9 percent) disabilities where there have been no recent breakthroughs. However, for people with cognitive disabilities, there is a 24.2 percent employment rate, which is especially important because there are proven programs such as Project SEARCH that have achieved a 73 percent employment rate for their approximately 2500 participants each year. By dramatically expanding Project Search and other proven youth transition and assistive technologies programs, hundreds of thousands of people with intellectual and other disabilities could enter the workforce successfully. There also is a 24.2 percent success rate for people with ambulatory disabilities, an area where also outcomes could be significantly better if best practices were used by the government. The lack of employment for people with disabilities correlates to many other issues. Almost thirty percent (28.1 percent) of U.S. civilians with disabilities of working-age in 2014 were living in poverty. Between 2007 and 2014, there was a four percent increase of Americans with disabilities who are living in poverty. For those without disabilities, the national poverty rate was less than half - 13.3 percent. People with disabilities have the highest poverty rate of any minority community in the United States. A new study by the Bureau of Justice Statistics shows that 32 percent of all people in federal prisons and 40 percent of those in jail have a diagnosed disability. The U.S. rate for smoking for people with disabilities was 24.5 percent in 2014, much higher than the 15.3 percent rate for people with disabilities. Additionally, the U.S. obesity rate for people with disabilities was 41.1 percent. For people without disabilities the obesity rate was 25.2 percent. Ending failed systems and replacing them with innovation and best practices is vital. Jobs and careers - especially youth employment for people with disabilities - must be a central part of any serious anti-poverty and workforce development strategy. This can be win-win-win for employers, taxpayers and people with disabilities alike. Data from the most recent Disability Compendium's 2015 Disability Statistics Annual Report shows that nationally only 34.4 percent of U.S. civilians with disabilities ages 18-64 living in the community were employed in 2014, compared to 75.4 percent for people without disabilities - a massive gap of 41 percentage points in the labor force participation rates. This leads to poverty, prison and poor health outcomes. Progress on these issues requires a real look at the performance metrics being used around poverty and employment. Only when we understand the facts and use best practices will we be able to move ahead so that people with disabilities can have the jobs and opportunities that we want and deserve.